You are a space holder. You are committed to your life, to your discipline, to joy, and to service. You have been facilitating personal and group healing while also considering how to take your knowledge of wisdom and healing to the next step in its evolution. A two-part 100-Hour Shamanic Reiki Master Training beginning with a 5-day Shamanic Reiki initiation in nature and followed by a 4-month continuation of the course in Greenpoint, Brooklyn. This course will be co-guided by Brooke Hamre Gillespie, Leona Walker, and Nicole Adriana Casanova. Our program includes modules as well as practices and homework to be assigned and completed between each module. Our group meets twice a month every other week and we will have a private Facebook group for our training so that on off weeks sharing and questions can be addressed there. Completion and Certification of Reiki Level 1 and Reiki Level 2 and a preliminary interview with Brooke, Leona, and Nicole. Review Day prior to the training for Reiki Level 1 and 2 Review: will be scheduled outside of the training. All students must participate in at least 3 shares. 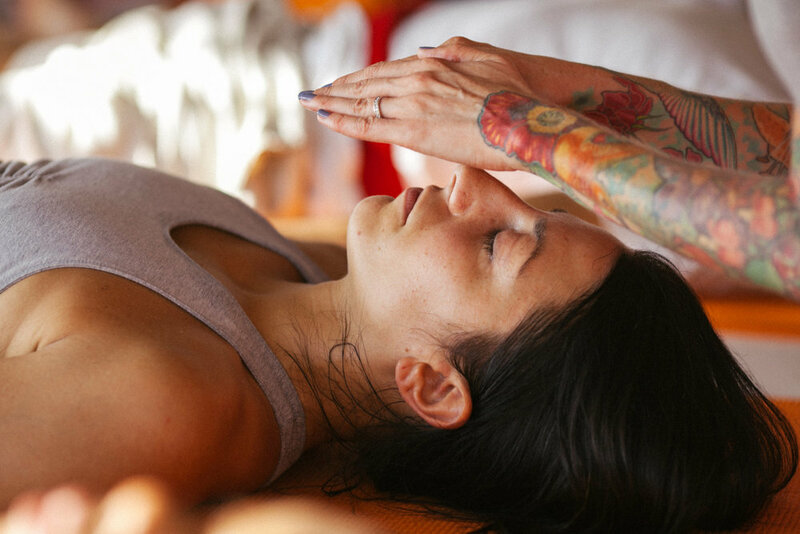 Volunteer Reiki at a facility and date chosen by the group. Cost: $2500 total. Space is limited! Reserve your spot today with an initial registration fee of $1,000. Full payment due by June 24th (day 1 of the retreat). Brooke Hamre Gillespie is a student of Maestro Manuel Rufino learning traditional native healing ways and an active member of the Golden Drum community. She is a Reiki Master, Sound Healer, Pleiadian Lightworker, and Shamanic Healer who has been practicing healing techniques for over 14 years. She is dedicated to learning, honoring and sharing the teachings of the sacred traditions of humanity and the Aquarian Age through healing, music, and art. She is available for private Reiki, Shamanic Healing, and Sound Healing sessions as well as trainings in the NYC area and anywhere in the world. Nicole Adriana Casanova is a student of Maestro Manuel Rufino, Taino Elder and founder of Golden Drum cultural center in Brooklyn, New York. Nicole is a writer, poet, and storyteller, a 200 RYT Yoga Alliance certified Yoga and Meditation Teacher, a certified Reiki Master in the Usui and Karuna Reiki Riojo, a Shamanic Practitioner, a Human Movement teacher, and Magical Awakening Practitioner. Nicole blends decades of expertise in the wellness and holistic field to create one of a kind empowerment experiences in groups as well as one-on-one settings. As a Soul Architect, Nicole bridges practices and teachings from various wisdom traditions around the world, with intuitive knowledge and practical know how to create one of a kind blueprints of empowerment, healing, and remembrance.